Just as some people find it difficult to be satisfied, the same is true of blackbirds. Quimby began complaining as soon as he burst out of his shell, joining his siblings in a nest high in a tree. His mother and father were fine parents, presenting their offspring with choice worms and juicy grubs. Quimby wanted caviar. His brothers and sisters were pleasant and cooperative little birds. Quimby was always pushing against them so heʼd have more room in the nest. Finally the day came when the young blackbirds left the nest and started flying for their own food. Mr. and Mrs. Black were secretly relieved that they wouldnʼt have to be listening to Quimby whine all the time. But others in the woods were not so lucky. The raccoon living near Quimbyʼs new perch soon grew weary of the litany of complaints. So did the squirrel family. Quimby told them he wanted fur like theirs, not lousy feathers, because he thought it would be warmer in winter and would look better. In desperation, a wise old owl, who occupied a choice spot on an oak branch, called upon his friend Elmer the Elf for help. Elmer offered Quimby a way to get what he wanted. Quimby happily accepted Elmerʼs offer. Telling the bird heʼd have to sit on the ground for the procedure to be safe, Elmer waved a magic stick, chanted a special spell, and suddenly Quimby was … a black cat. He was happy for a day. Then he started squalling with piercing cries. The fur itched. It was too hot. He missed flying. He didnʼt want to chase birds and mice. The animals said they couldnʼt put up with Quimby any more and left for new homes in faraway places. Quimby soon had no one to whom he could complain. So he complained to himself – about being lonely. Finally a family of humans who enjoy talkative cats adopted Quimby. He complains all he wants and they still love him. 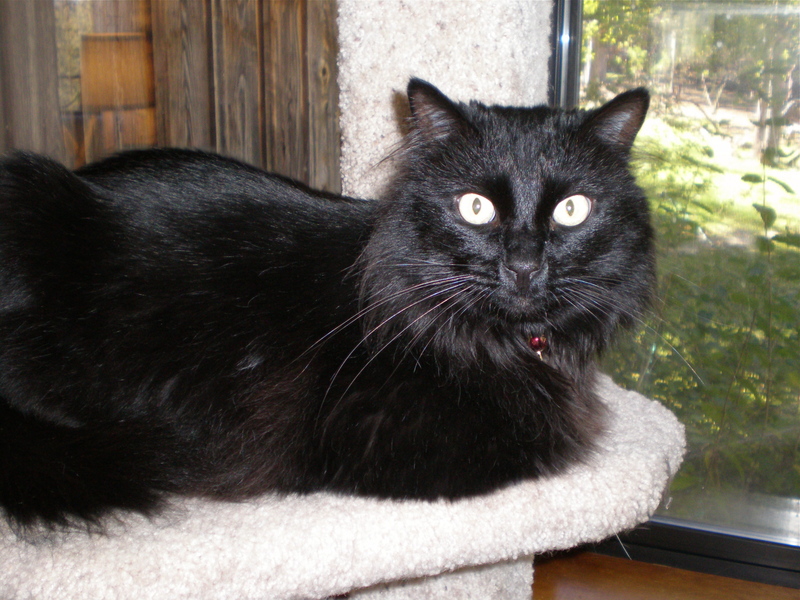 Quimby in his new home – where black cats, and complaining, are accepted.